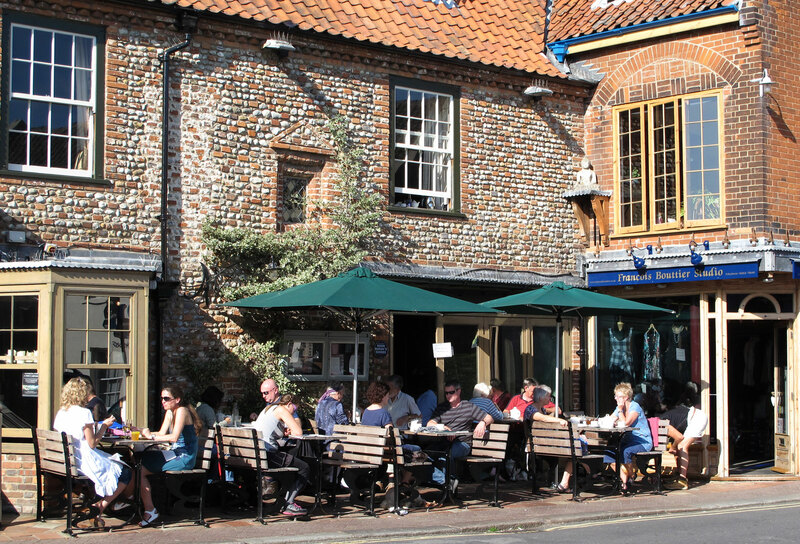 During your stay at Cranmer Norfolk Luxury Cottages, why not enjoy a meal in a great local Norfolk restaurant? These restaurants tend to be busy during the holiday season so booking early is recommended. Our favorite local. Newly refurbished stylish pub overlooking the village green. Fab food, great atmosphere and child and allergy friendly. Part of the small cluster of restaurants owned by local celebrity chef Chris Coubrough. The Crown has a private dining room which seats 36 – ideal for celebrations and private parties. Cabbing distance from Cranmer 20 mins. Morston Hall has a Michellin Star and an excellent reputation for good quality formal dining and a special treat. This restaurant gets very booked at weekends; it may be easier to get a table during the week. It is advisable to book in advance of your holiday. Recently refurbished hotel owned by the Coke family of Holkham Hall. Try Sunday lunch here followed by a walk on Holkham beach just at the end of Lady Ann’s Drive opposite. Child friendly at lunchtimes with swings and play area outside. 8 mile cycle ride from Cranmer along the roman road – great for lunch on a sunny day. Whether you eat casually in the bar, or more formally in the restaurant, every meal at The Crown is freshly prepared from the best ingredients. The Crown in Wells is a part of the cluster of local restaurants owned by local celebrity chef Chris Coubrough. Undistinguished from the road, but this pub/restaurant has been expanded recently and offers wonderful uninterrupted views across the marshes.Ggood food using local, seasonal ingredients. The Kings Head, Holt Rd, Letheringsett 01263 712691 Following an extensive renovation,The Kings Head has now re-opened to offer a traditional pub/restaurant atmosphere with a homely mix of period features and modern-day comfort. A great place to stop for coffee and croissants on the way to Holt or afternoon tea on the way back – also brunch and of course dinner. The Gin Trap Inn 6 High Street, Ringstead 01485 525264 www.gintrapinn.co.uk The food is traditional and unashamedly British, with such menu items as homemade steak and kidney pie, local sausages, Norfolk pie and one of the best Ploughman’s Lunches. Expect to encounter local oysters, mussels and samphire. Titchwell Manor Hotel 01485 210221 www.titchwellmanor.com Titchwell Manor is renowned for its food – especially its range of dishes unsing local produce. Fresh fish and shellfish feature prominently on their well crafted a la carte and ‘specials’ menus. Their head chef Eric Snaith, restaurant manager Mark Dobby and their young team are constantly striving to tempt you with fresh ideas, flavours and gastronomic experiences. The Neptune Inn Restaurant (Old Hunstanton) 01485 532122 www.theneptune.co.uk Seasonal menu. This Norfolk restaurant has recently been awarded a Michellin Star. The chef, Jon Cleland, only uses fresh local produce. New England themed, great reputation. The Old Forge Seafood Restaurant (Thursford) 01328 878345 www.seafoodnorthnorfolk.co.uk Predominately seafood on menu, all locally caught. Highly recommended by local food critics. Meat dish always available. The Moorings (Blakeney) 01263 740054 www.blakeney-moorings.co.uk Fresh simple honest food – great local fish, shellfish, game in season, delicious meat and vegetarian dishes, puddings, and a well chosen wine list. Situated on the High Street, close to the quay. Byfords Cafe, Winebar & Deli (Holt) 01263 711400 www.byfords.org.uk Restaurant, cafe and delicatessen serving locally produced food in a cosy setting. Lunches, teas and dinner. Great for a leisurely Sunday morning brunch. The Corner House Restaurant and Bar (Wells-next-the-Sea) 01328 710701 Stylish oyster bar & restaurant. Freshly prepared seafood, meat, rare breed beef, game & vegetarian dishes. Live music. Cocktails. Cask ales. The Globe Inn (Wells-next-the-Sea) 01328 710206 www.theglobeatwells.co.uk Pub/restaurant on the Butlands – a lovely Georgian square with a huge green for children to play on. Simple home-cooked food available as bar meals or snacks or childrens’ meals, using local and seasonal ingredients. The Walpole Arms Itteringham (near Aylsham) 01263 587258 www.thewalpolearms.co.uk. Multi-award winning food and drink served in 18th Century oak-beamed bar and romantic restaurant – in summer, garden & terrace. The King’s Head (Great Bircham) 01485 578265 www.the-kings-head-bircham.co.uk. Stylish award winning hotel restaurant, innovative and unfussy menus. Young Norfolk chef who uses local seasonal fresh produce. North Creake. Good food with an interesting menu – traditional pub atmosphere. Family friendly. On the Burnham Market road, next village to South Creake. Full of tradition – this was Nelson’s local until he held his farewell party there in 1796. Thoroughly recommended and very cosy in winter. ‘Chelsea by Sea’ – a picturesque upmarket village with pub to match. Trendy establishment with good food and atmosphere. 17th century main building facing the marshes with large conservatory at rear. Very good reputation for food. Traditional Norfolk pub with gas lighting and good local food. Real ales. Traditional real ales, tea & coffee. Freshly cooked meals from local produce. The Norfolk Riddle Restaurant and Fish & Chip Shop, Walsingham (Tel: 01328 821903) Stylish restaurant serving delicious farmhouse fare freshly cooked from local produce. Eat in or takeaway. Relaxed dining with log fire in winter and alfresco dining on the terrace in the summer. Children & family groups welcome. Chips cooked in local beef lard (takeaway 10 minutes from Cranmer). Frenches Fish & Chips, Wells-Next-the-Sea on the quayside – be prepared to queue, but worth it though! Wander along the sea wall and eat fish and chips as the sun goes down over the harbour. Drifters Fish & Chips, Oak St, Fakenham Good quality fish & chips. Pleasant restaurant and takeaway.